We run regular online “hangouts” where we get together to discuss things we’ve been building. These events happen on the third Thursday of every month and are organized via the forum. Anyone can come along and contribute. Hangouts are an opportunity for folks to learn more about open source tech work done at Open Knowledge International as well as to present and discuss projects and ideas from the community. We will also discuss any general Labs administrative issues such as improvements to website, upcoming events, etc. If you’d like to present something, please edit the relevant hangout topic and add it to the agenda (slots are max 5m). 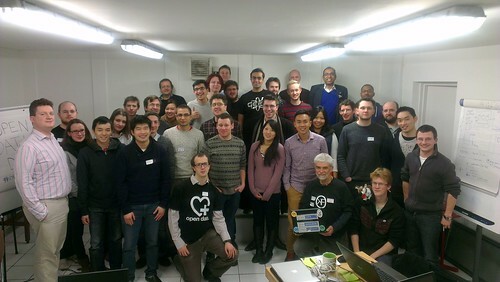 We also run in-person Open Data Maker Events. These are informal events focused on “making” with open data – whether that’s creating apps or insights. They aren’t a general meetup – if you come, expect to get pulled into actually building something, though we won’t force you! The events usually have short introductory talks about specific projects and suggestions for things to work on. It’s also absolutely fine to turn up knowing nothing about data, coding or openness – people will be happy to share their knowledge and there’ll always be an activity for you to help with and someone to guide you in contributing! Create an event page with signup. Add information: when, where, what, who (signup). You could copy and paste the outline above for the what. Fill in this form so we can list it. Post on Facebook, G+, etc. Create a Scratchpad: Prep a scratchpad using etherpad, Google Doc, or a new forum topic. You can run your event however you like. This is a suggested outline for for a 2-3h evening event. If you want some suggestions or help just get in touch.